One pixel two, two pixel twos, large pixel two, small pixel two, pixels twos everywhere. Except in Google online stores, but that's a whole different matter. The true Pixel experience in a (slightly) smaller package and minus the display issues - this is the Google Pixel 2 in size Medium and not Extra Large. You get the same everything with the Pixel 2 that you get with the XL - or mostly everything. That includes the top-end Qualcomm chipset, the industry-leading camera, and the stereo speakers, but leaves out the taller 18:9 display and with it some of the battery capacity. With yesterday's 16:9 5-incher on the front guarded by sizeable chin and forehead, the Pixel 2 looks decidedly out of touch with current trends for bezellessness. A classic, you can call it. Leading them trends, however, is the camera - what others do with two, the Pixel 2 does with one - computational photography for the win. If you've already read our Pixel 2 XL review, you're probably familiar with most of the specs, but you can always go over the following list for a refresher and a quick round of spot the difference. Misc: Fingerprint scanner, dual stereo speakers, Always-on/Ambient display, Active Edge squeeze detection. No 3.5mm headphone jack (ships with an adapter). Video camera records mono audio only. You can't assign the Active Edge squeeze detection any other feature but Google Assistant. We know you have to fit the innards somewhere, but still - bezels. 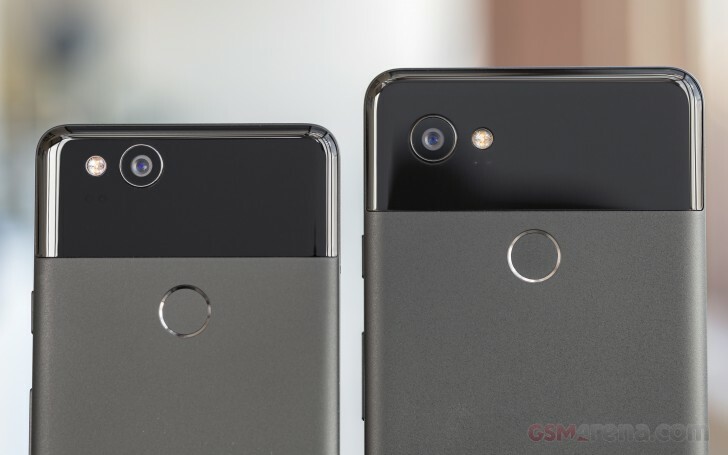 With so much being the same between the two Pixel 2s, there's no escaping the fact that they share the same weak points. You wouldn't expect Google to stick a microSD slot or a headphone jack in the small Pixel 2 and not the big one, right? Here, however, we'll be adding bezels to the list of shortcomings - for the reduction in display area you're not getting all that much savings in terms of actual size. Don't read that the wrong way - we like battery, and speakers, and all, it's just that the display diagonal makes a promise the physical dimensions can't keep. One thing's for sure, though - the Pixel 2 non-XL is smaller enough to be more easily squeezable. We'll touch on that on the next page when we go over the hardware.